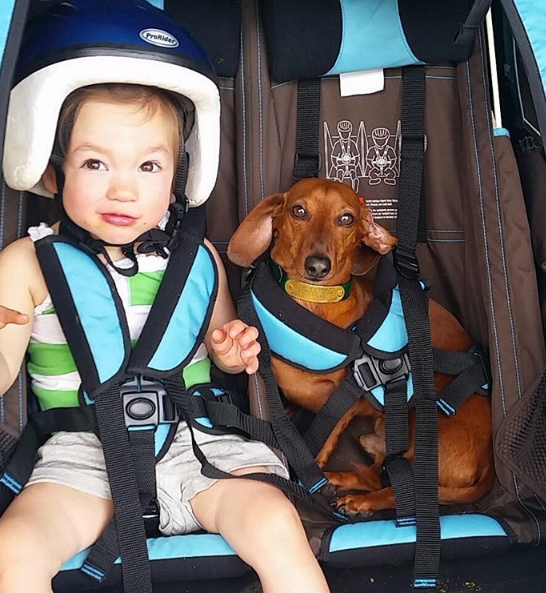 Review of the Croozer 2016 Kid Plus for two bike trailer, stroller and jogger- perfect for biking, walking and running! I talk a lot about being active as a family and how important it is to me. Our most common way to be active is to go on walks together. Before I was pregnant with Adalyn, my sister and I loved to bike together. I remember going on one super long (for me) bike ride that was 15 miles. Since I had Adalyn, I have barely biked. The reason is because I forgot how much I liked it and I did not have a bike seat or bike trailer to bring Adalyn along in. -Super easy to strap Adalyn in- takes two seconds. -Adalyn is so comfortable in there that she rarely complains. On a walk in her regular stroller, she often whines and asks for snacks. In the Croozer, she is oddly quiet the entire time. -There are side pockets which I always put a water bottle in so that Adalyn can stay hydrated in the heat. -When we hit a big bump, Adalyn does not go flying. The shocks are very good. -Switching from the bike trailer to the stroller takes 30 seconds or less- I cannot believe that it is so easy. We have a park that we love to bike to but you are not allowed to bike in the park. Once we get there, we just switch it to the stroller setting and keep moving. I love that! -The stroller is awesome- I can literally push it all around our park and up a hill- what other stroller moves that easily? -It has a ton of storage room- I can put our towels, bathing suit, water, snacks, etc. in the back storage area when we bike to the park and still have extra room. -The Croozer bike trailer is easy to pull while biking without a ton of extra weight- it obviously feels different than biking without a trailer attached but is actually quite comfortable to pull. I use it every time and can do 5-6 miles at a time right now. -It has a 2 part cover- we mostly just use the insect cover but if it is going to rain while we are out, we can put down the rain cover as well. -The best part about the trailer- it is dog friendly too- lol!! -Has the ability to hold an infant- when we eventually have another child, I want to get the baby sling so that we can bike with the baby. -The trailer is large and even when folded up, does not fit in my car which is a mid-sized SUV- I wish that it was a little smaller so that I could take it places. -That's it- we seriously love it! I would not give the stroller a rave review if we were not obsessed. I am so thrilled to be back biking. I was in such a rut with walking and have a fun workout to look forward to each day now. In the beginning, my thighs burned so badly when biking because I just was not in great biking shape but I notice that each day, it gets a little easier. Disclosure: We were provided with a complimentary product in exchange for a review. All opinions are my own.